Future communications will come from there. All of the original posts and whatnot will stay here as a "vault" of sorts. This week he doesn't just have another article out about him, but he is actually on the COVER of FRETBOARD JOURNAL, and there is both an interview in the beautifully packaged magazine, as well in a podcast which you can check out by clicking the link right HERE... And YEA! TEST APES are mentioned in both...good job on top of an already good job DANNY! Slowly but surely the word will get out. The press and attention given to our boy Danny since receiving the Steve Martin Award has been great and well deserved, and TEST APES hope to make use of this momentum... That said, we hope to have some new releases soon: a FULL LEGNTH LP and a little 2-song thing are in the works! Check out an article about it, by clicking here! Congrats DANNY, you deserve it!! Also, we had an opportunity to hang out and jam with the one and only Bill Frisell the other day... what a pleasure! Ah! The "Mystery Tool" ep is out! Man, it feels good to release that one. For whatever reason, Mystery Tool is one of those projects I'm most proud of. Its just a nice little ep, nothing fancy. 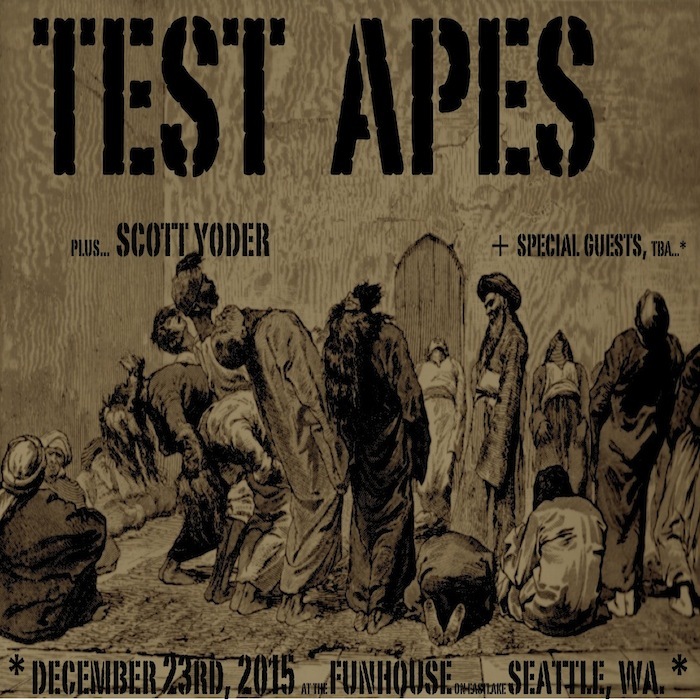 So, whats next for TEST APES? Whats next, is more of the same, really. We have a number of songs written and partially recorded. There seems to be a couple more eps shaping up...but no titles yet. Danny is in and out of town a lot, so our schedule is a tad spotty. Still, things can move forward in some ways...I don't want to make any timeline promises, yet...but we're talking months, not years. But first, I want to post the TEST APES video blog that I forgot to release about a month, two months ago! Whoops!! 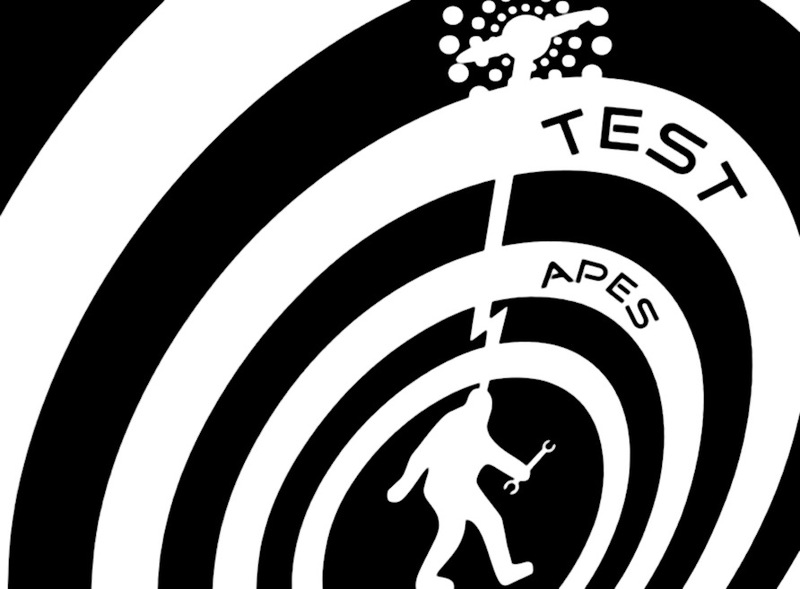 go to TEST APES on Bandcamp.com ...or read, hear and watch MORE by checking it out on THIS site. 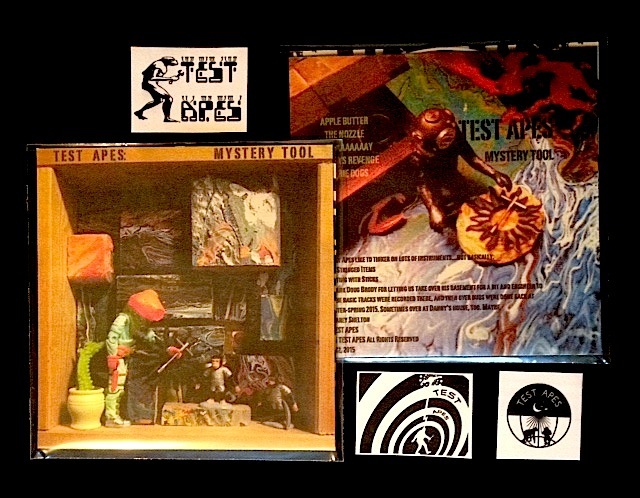 TEST APES have booked a mastering session on April 2nd with Garey Shelton... a new release is imminent! We played a couple of gigs! September 23rd and 26th in Seattle. We survived! It was quite an experience, and we learned a lot. In fact, I'm pleased to announce our LIVE 3-song "single"
"TEST APES: Sea Monster Runway EP"
I experimented with trying to record and video the gigs, but did not have good results with the video I'm sorry to say, although I have a plan for next time...Plus we did get a pretty good sounding audio "report card" to listen back to and analyze what we did, and how we felt about it. We came to our first gig (tah-dah!) with about 40 minutes of material-- sorta rehearsed. Like 3 times? Maybe 4? I know we were of the mindset like, that this was our first one, and we were just gonna have to take our lumps and learn form it. When we got there, we were told we had as much as 2 hours, if we wanted it...gulp! So we decided to man up, take advantage of that time and stretched out improvisationally for about an hour, then ran through our set of tunes. Looking back the next few days, we felt like some of the improvised stuff was more fun to play than the songs-- which were ok and all, and we played them alright --but were stiffer and even kinda confining compared to just playing whatever. Jamming is how we start writing a song, anyway. So we had really done way more in that mode than really playing our songs from the record over and over to get them to sound tight... or like the record so we could promote a record...er, something...like a rock band might or something. It was kind of an eye opener because we had not intended to be a free-jazz band or a jam-band, but now we’re thinking about it. Until then I think we were more oriented toward mostly playing our songs from the record, with some little improvised segue bits on occasion. Now though, who knows... There is something really exciting about an improvised jam that people react to, too. But it IS risky. You have to not be in a lousy mood or in crappy health. I love Sgt. Pepper styled multi track recordings, and some production slickness and all that, too...but it can’t be performed to sound like the record without hiring a large band. I felt like we gave the crowd a good value by performing something un-rehearsed as well as rehearsed. During the second show, we started improvising off from the form of some songs with interesting results, too. I've focused on a couple of those for the EP...But there is also a snippet of improv we both kinda liked and might make into some kind of a song someday. The purpose of releasing these live recordings is to document a few of these type moments during these first shows. Also a bunch of folks were curious what we would sound like live after we put out our first album that was quite multi tracked. 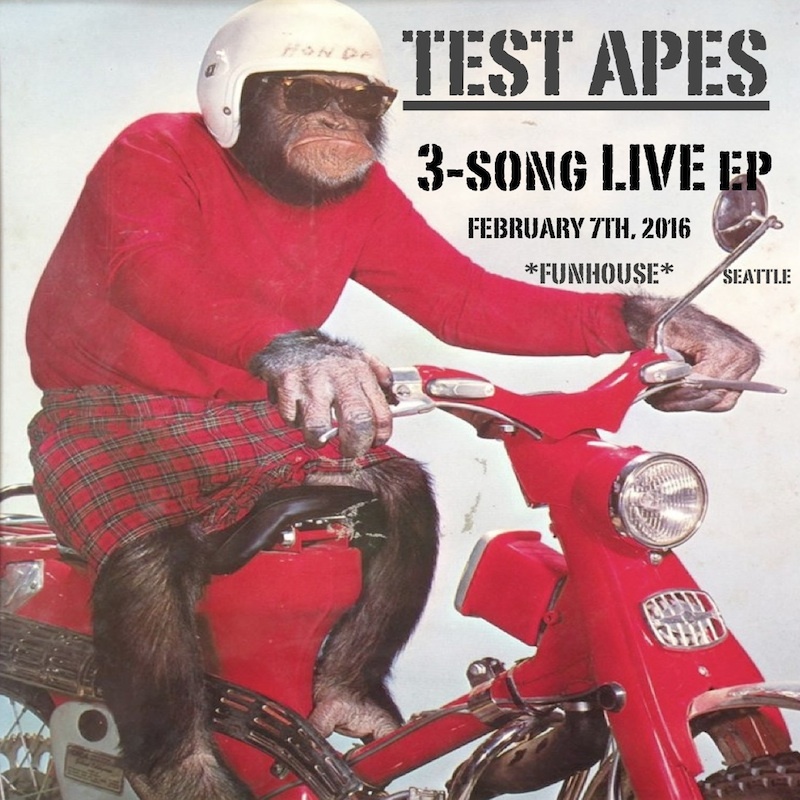 So in addition, it demonstrates what TEST APES might sound like if you were to see us live. hit the link below for a shortcut to the EP on this site. Next on our agenda is to work on our second album which is already way in the works, and look for places or events that we'd like to try to play. If you have any ideas for us, let me know! 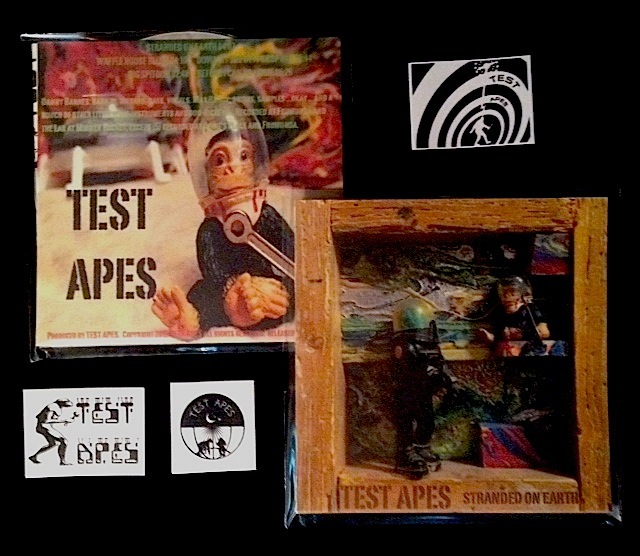 ...And here is a link to the updated BANDCAMP.com TEST APES page! Well! We've started a new chapter! 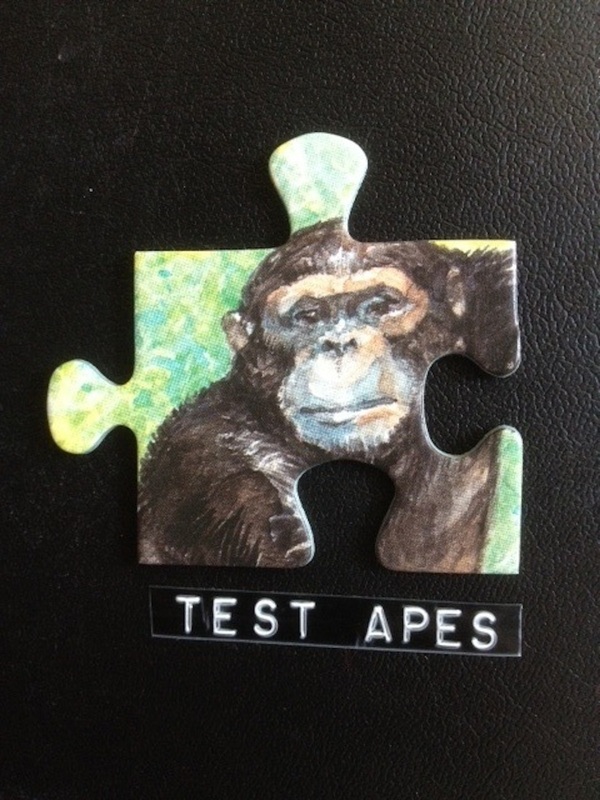 Test Apes have finished their first album and are getting ready to perform shows, as well as continuing to compose and record new material. I have taken all of the old news blurbs and videos, etc, and put them on the homepage for the first album; chapter one is done. And so, starting now on this page will be news about the next album, rehearsals, and what ever comes next. Yea!